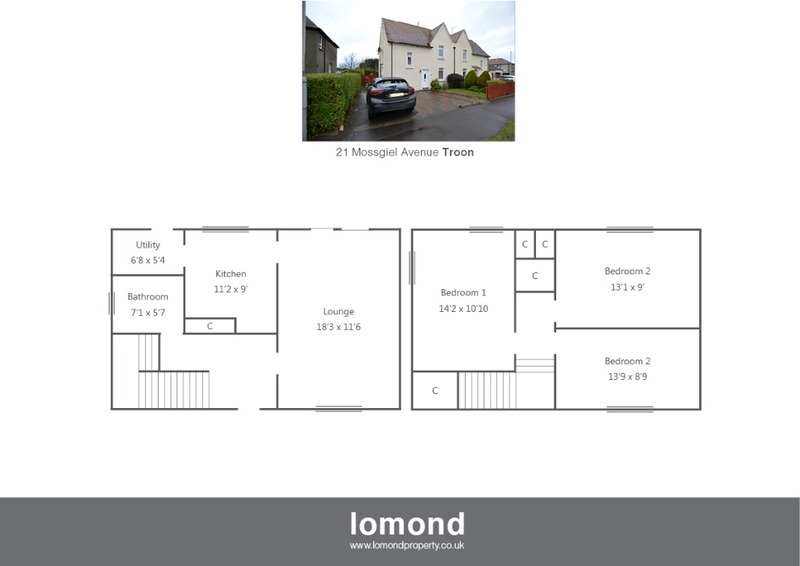 Situated just a short walk from both primary and secondary schools, 21 Mossgiel Avenue is a semi detached villa offering excellent family sized accommodation over levels. The property benefits from south facing private gardens, off street parking and recently upgraded double glazing, bathroom, and central heating system. In greater detail the ground floor extends to a spacious and welcoming hallway with storage cupboard off, and stairs to the upper level. The lounge stretches the entire length of the lounge with electric fire, and patio doors to the rear garden. The kitchen is well stocked with floor and wall mounted units, integrated gas hob, oven and hood. Off the kitchen, there is a utility room which in turn gives access to the rear garden. The family bathroom is off the half landing, and comes with walk in shower, WC and WHB, all finished to modern wet wall panelling. Stairs lead to the upper levels with three double bedrooms, all of which come with fitted storage space. Externally to the front there is off street parking for 2-3 cars. To the rear the garden is south facing, laid to a combination of lawn and patio slabbing ideal for summer dining. The property benefits from recently fitted double glazing and a gas central heating, complete with Hive system. Mossgiel Avenue is an established residential area, situated just a short walk from both primary and secondary schools. Troon provides a number of bars, restaurants, coffee shops and supermarkets. Troon has its own beach and is most famous for its Golf, with no less than 7 golf courses within the town. There is a regular train service to both Glasgow and Ayr.